CDN and MRC Centre for Neurodevelopmental Disorders investigator, Benedikt Berninger, has identified, along with several colleagues, stage-specific transcription factors that drive astrogliogenesis by remodelling the gene regulatory landscape. Their new paper published in Cell Stem Cell gives us a valuable insight into some of the molecular mechanisms that govern cell fate specification during the development of the central nervous system. Little is known about how neural stem cells are specified toward astrocyte fate and how glial and neuronal lineages diverge during brain development. Probing these areas, Benedikt and his colleagues performed a comprehensive series of transcriptomic and epigenomic analyses to define the gene regulatory programmes implicated in the pathway from mouse embryonic stem cells to astrocytes. 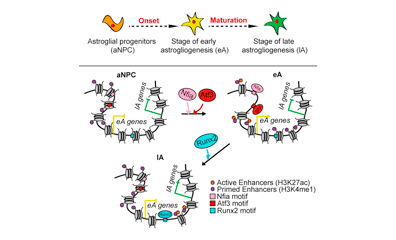 In their paper, the authors report their findings that molecularly distinct transcriptional programmes define consecutive stages of astrogliogenesis. They found stage- and lineage-specific regulatory elements and transcriptional programmes that underlie astrocyte generation and maturation. 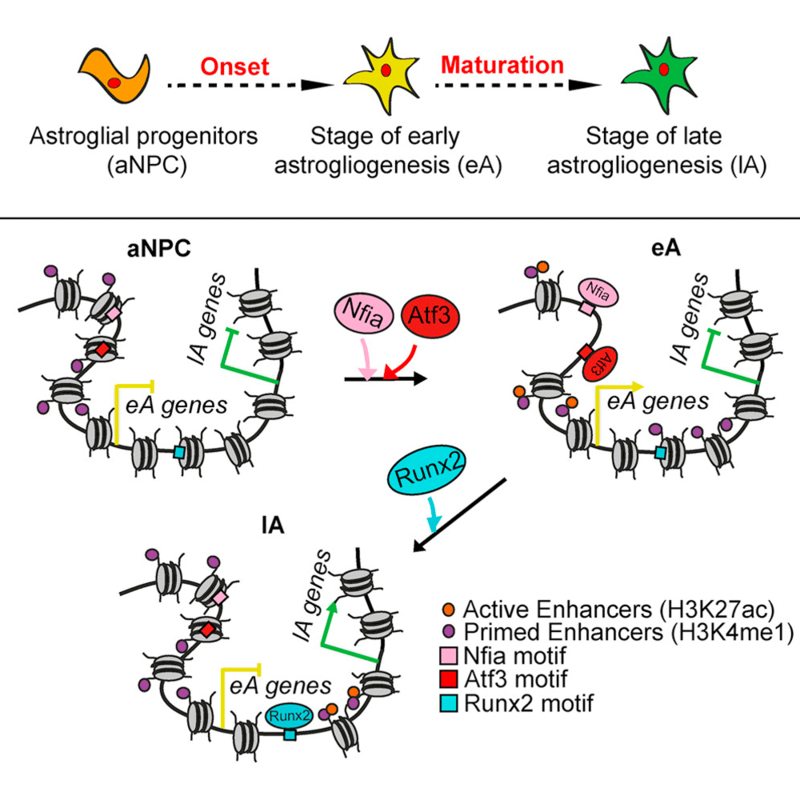 Whilst transcription factors ATF3 and NFIA drive astrocyte differentiation, RUNX2 promotes the maturation of astrocytes. These transcription factors switch the chromatin state of their target regulatory elements from primed to active, supporting stage-specific gene expressions programmes. Benedikt and his colleagues’ novel findings raise interesting questions for further investigation including precisely how the transcription factors that drive astrogliogenesis are activated. The study gives us an insight into the divergence of glial and neuronal lineages during development and provide a rich resource for investigating these regulators further.